My husband and I finally forgot about how difficult life becomes when you adopt a puppy. Our last “puppy” (if you can call our 16 and a half year old dog, Sprite, a puppy) passed away five years ago. Yep! It took us all these years since Sprite was really a puppy to forget about the chewing of furniture/walls/shoes, the almost hourly wake-ups during the night, the baby rails locking off the kitchen, and the continual need to sit on the floor playing tug-of-war and squeaky-ball-toss. Her name is Cocoa. We considered for a long time naming her “Cola” as a sort of tribute to our beloved Bichon, “Sprite” (although Sprite was not named for the soft drink but rather for elf-type sprites because of the way she hip-hopped on the grass when she was a little puppy.) Our new puppy is so dark that we considered Cola to be a good name because of the color and the reference to Sprite. Also, she has almost no tail so “Cola”, (meaning tail in Spanish) seemed like a fun reverse description. However, we just couldn’t get used to calling her Cola. Somehow when we tried Cocoa, the name just seemed to fit. So, Cocoa it is! Well, I just thought I’d let you all know about our family’s newest addition. I have to go now, Cocoa’s nature is calling! So precious! Reminds me of our Yorkie Murphy when he was about 8 weeks old. Puppies bring so much light and love into our lives. I can’t imagine not having a puppy around to love, especially now that we’re empty nesters. Enjoy her! N, I agree and feel exactly the same way. Danna: She is adorable and Cocoa is perfect for that little face! I don’t have a dog now as Dad can’t care for one and I had to give up my long haired Daschund, Max but thankfully found him a good home. I still miss him and I can relate to waiting a long time before I’m ready. After Dad passes, I’ll probably get a 2 year old that is potty trained at a shelter to give a good dog a loving home. But I help with a neighbor’s dog. 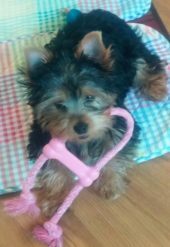 I can relate to the puppy training issues that you and hubby face but it is a joy to be able to do it and have such a cute dog to love you both. Rob, I’m sorry that you can’t keep Max in your current situation, but at least you did the responsible thing and found him a good home! We were looking to adopt a slightly older pet at one point, but our list of requirements quickly became a bit too selective, and we were finding that most dogs we were looking at already had a number of applicants in line. So far we’ve been pad training her >>> which is proving much easier than house training Sprite was! We’re still discussing if/when we will switch to house training. Congratulations! She’s adorable. And remember time goes so fast–she won’t be a puppy for long. Marie, Yes – it goes fast. Reminds me of having young children – a lot of good along with some extra work. This entry is as good as the mystery ones. Cocoa is adorable. Welcome to the Cozy family Cocoa. Sheila in CT, thank you from me and Cocoa. I have the same worry about my cats scooting under my feet. I’m so glad you didn’t break anything. You may have strained a tendon or something though, so you may want to look up therapeutic protocols for strained muscles/tendons. Hope you feel better soon! Marja, lucky for me (and Cocoa) that my husband is being a trooper. And toilet paper, underwear (yours and hubby’s), hats, clothes and yes, furniture! She’ll chew them all! You’ll have crotchless undies all over, Air conditioned bras and nameless other articles of clothing. If you get her chewie things, my vet does not recommend rawhide! They have deer and elk antlers that are safer, and Milk bones and greenies that keep the tartar off the teeth. Rawhide glops up in the stomach and can cause ailments and even cancer later in life. Please stay away from the rawhides, for Cocoa’s sake. This isn’t something that is well known unless you accidentally run into it. Hope this helps you and your family. A real bone like a stew or soup bone that is cooked or boiled in broth will help her keep her teeth clean and is safe. Congratulations on your new puppy! She’s adorable.They are always puppies in my eyes. We have a West Highland White Terrier who recently turned 4 years old. She’s our baby! Tiffani, that’s the way I feel too. Sprite was always a puppy in my eyes. Puppies – Gotta love them. Hope your recovery from your fall moves along more quickly now! jane, thanks — I am feeling much better and am about to take on some extra puppy duties! There’s nothing like a new member in the family. I’m glad Cocoa has a good home and you have Cocoa to love. She is adorable. Worth every speck of the work. Marie, I think so too! Congratulations! No matter how rotten a day can be, when you come home to your puppy, then its a good day. Cocoa is a cutie, enjoy the new love. ? Janet, one of the names we were thinking about was “cutie”. Congratulations!!! I wish you many joyous years with Cocoa. Congratulations on the new addition! I have a 3 year old yorkie who weighs 4 lbs. “Cookie” had knee surgery a couple of weeks ago and I have been getting up at 1am to administer meds, check temperature, and bandages. Then we have to do it all over again in January on the other leg. I love my fur baby! KG, I’m sorry about your yorkie’s problem. I’m glad Cookie has you. Good luck with Cocoa! She is adorable! I hope your foot feels better soon – And your husband doesn’t turn the tables back on you re: nighttime instructions! Lol! It sounds like ‘cocoa’ was meant to be her name – if it felt right, and the other just never came out right. Lots of pats to Cocoa – who looks like some sort of silky terrier? Yes? – and have fun! Susan*, we also thought about “cutie” for her name too but I think you are right — “Cocoa” just felt right. She is a Yorkie and is 14 weeks and 2.8 pounds (so far). I had a Yorkie about 10 years ago and just loved her! Melissa, thanks! We think she’s cute too! Oh, Danna, Cocoa is absolutely adorable! The dog lover in me suggests you post photos of her every day. What breed is she? (I don’t think you mentioned it, or I’m exhausted from being on vacation and just can’t see!) You’re so lucky to have a little pup. We have a 170-pound Newfoundland named Riley. Love him to pieces, but he can’t exactly sit on my lap and he slobbers… a lot! I love all dogs and would happily get another–little one–but my husband is against it. Since he’s the cleaner-upper, I guess I have to give in to his wishes. Now, please don’t trip over anything else, especially Cocoa–unless you want to keep from having to do those middle-of-the-night chores! CONGRATULATIONS on the new additon to your family. I strongly believe a house is not a home with out fur people. You will bring her just as much joy and love as she will bring you. Happiness and joy to all of you. Danna, She is really cute. I too got a new puppy about 2 months ago. I hadn’t had a puppy for about 9 yrs. How soon you forget about how much work they are. I had a 12 yr. old Yorkie that passed in June. Still have a 9 yr. old Yorkie. Decided to get a Morkie. He is a real energetic puppy. That is putting it mildly. I hope you enjoy your new puppy. Good luck!! Diana, I’m sorry about your Yorkie passing. I know how difficult it is when our little pets leave us. I looked up images of Morkies, and they are way too cute! I hope your 9 year old Yorkie is teaching him what NOT to do! Danna, I’m so happy for you. Congratulations!! She’s such a cutie-pie. I chuckled when I read she weighs 2.8 pounds. My grandpuppy is 86 pounds of muscle. He likes to sit behind me when I’m doing dishes so I’m always worried about tripping over him. LOL! Cocoa will give you many years of joy and love. Nothing like a dog!! Linda MH, it sounds like he’s trying to prop you up! How cute is that? 86 pounds: That’s a whole lot of puppy chow! A “little hearbeat at your feet”! What could be more precious than that! Marianne, I’m looking forward to the time that Cocoa will be a “little hearbeat at your feet”. As it is right now, she’s more interested in being a little chewer at our feet! Congratulations on your new addition! She’s adorable. Danna, it sounds like Cocoa has all of ‘you’ trained, already! Lol! Susan, you might be on to something! Congratulations! She is such a cute puppy. Congratulations on your new puppy! She is adorable and I love her name. May you enjoy many happy years together!! Sharon, thank you very much! I think your story of adopting Cocoa has generated more responses than any mystery! Congratulations. We lost our last dog, a Maltese, 2 and 1/2 years ago at the age of 18. Since we have 10 cats, I swore I wasn’t getting another dog. Than I started volunteering at a dog rescue and we now have an 8 month old terrier mix that we adopted 4 months ago. Puppies can be trying at times, but I keep telling myself it doesn’t last forever! Carol, I certainly know what you mean! I will say that Cocoa is proving a bit easier to handle than Sprite was – so far she hasn’t shown any of the separation anxiety that Sprite did, which was far more destructive to our property than standard puppy toothing issues. Annette, thank you very much! What a precious new addition and new blessing to the household! And ‘Grace’, I wish I had a dollar for every time I’ve pulled a stunt like you did in hurling yourself over the baby gate! My Lord, I’ll bet you hurt all over! You know, I’ll bet Sprite is looking down from the Rainbow Bridge loving every minute of the new baby. Give Cocoa puppy kisses from our kitties and good old Mattie dog – much love from a soon to be cooler Houston! Petie, thanks! I’m getting better a little at a time. I certainly hope it does start getting a bit cooler soon – letting her exercise outside a bit more would certainly be nice, but it’s just too hot for us to be out for long now. Congratulations on Cocoa! Love your blog & website. Keep up the good work. Hope we get periodic updates about Cocoa too. Maggie, thanks! I’m trying to keep most of the blog focused on Cozies still, but I’m sure I’ll be mentioning Cocoa at times too! Congratulations on Cocoa! I have a dog named Maxwell and he brings so much joy to our lives. May Cocoa bring you the same! LuLu, thank you very much!